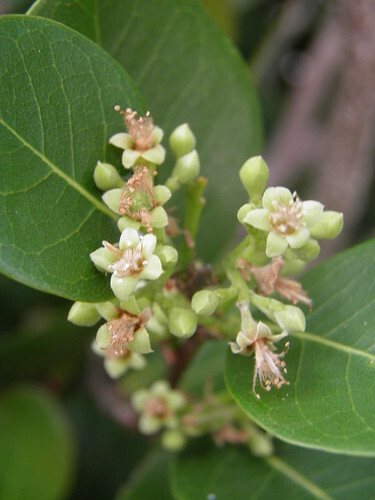 This native shrub grows wild along the coast in maritime hammocks, coastal dunes and inland in swamps, canal edges, moist forests and cypress hammocks from the Florida Keys up the east coast to Brevard county and up the west coast to Pasco county. It has been extensively planted as a landscape hedge and is found in more expanded areas near the coast. Fruits most often ripen to a dark purple-black, while other varieties may be pink, reddish, pale yellow, or white. Out on my favorite state park, Cayo Costa, many ripen to a lovely light pink color. Some folks claim the purple fruits to be juicier and therefore more choice. A few others that I know would choose the large pink varieties to be of better quality. I like 'em both equally! The ancient Florida Glades people consumed these fruits (drupes) in ancient times as do some Seminole to this day. A decent number of you know that the skin and pulp is edible, having a cotton candy-like consistency and slightly sweet flavor. Not too many of you know that the inner kernel (the seed inside the shell) is not only edible, both raw or cooked, but is quite delicious and is, in fact, my favorite part. It reminds many of a sprouted almond, being quite delicately flavored. I often use a pocket knife or toothpick to remove the seed. Although the inner kernel is edible, be careful not to crack a tooth should you try to open the large kernel to get to the tasty kernel. You would be wise to crack them open with a tool. 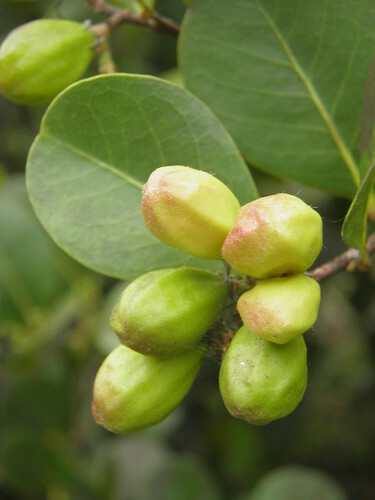 It is a common practice to make jelly from cocoplums in the Caribbean. I once made a fruit-and-nut spread from the pulp and the crushed seeds... it was wonderful! Some foragers, such as Erica Klopf, recommend salt-curing them and then putting them in oil, which does turn out to be quite yummy. You can try roasting the seeds as well. Wild birds consume the fruits, the shrubs provide cover for many animals, and many pollinating insects visit the flowers. CAUTION: Although the inner kernel (the seed inside the shell) is edible, be careful not to crack a tooth should you try to open the large kernel to get to the tasty kernel. You would be wise to crack them open with a nut cracker or similar tool. As it is so often clipped into a manageable hedge, take care not to harvest fruits from sprayed plants. I would advise asking homeowners if they spray their hedges or not. HEDGE OR SPECIMEN TREE: It is often planted as a clipped evergreen hedge. "It can be pruned into a multi-trunked small tree or specimen shrub." I like to see hedges that have been "wildly trimmed." Keep in mind that it is somewhat hurricane wind resistant. RITUAL USE: Seminole ritual uses, although written of in Florida Ethnobotany, are omitted here out of respect. "Fill up a jar and cover them in salt. Let it sit for maybe two weeks and then rinse them and put them in olive oil in the fridge for a week and then they are like olives." "Now, here's the recipe. Fill a large pot with plums. Add water until all plums are covered. Add two or three pounds of brown sugar and then start to boil. Once it is boiling, lower flame to simmer for several hours. Add some cinnamon sticks. 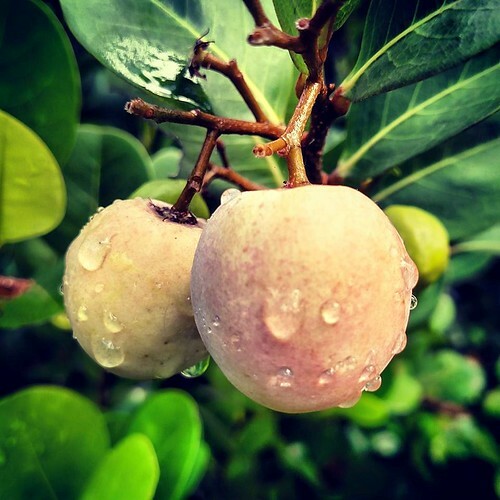 Soon the flesh of the cocoplum and the sugar will make a clear brown jelly with a unique taste that is typical only of Ambergris Caye and a few other places in the tropics. Now here is a little secret very few people know, and I want you to keep it a secret for long. Crack the nuts that are now well cooked and break them into small pieces, and scatter it in the jelly. Now you have delicious cocoplum jelly with nuts. Ummmm, that is super delicious." NATIVE TO: "Throughout tropical Africa, tropical Americas and the Caribbean, and in southern Florida and the Bahamas." Coastal areas of Florida and inland in coastal hammocks, the Everglades, etc. DESCRIPTION - Evergreen shrub or small tree. Most often multi-branched. HEIGHT: 15' tall. Rarely to 20-35' tall. SPACING: For a hedge, plant 3-4' apart. FRUIT: A drupe, round, usually ripens to a dark purple-black. Coastal forms tend to be pink, pale yellow, or white, and are rounder. Inland forms tend to be dark purple (or reddish) and are less round. Very thin edible skin. SEED: The fruit "contains a five- or six-ridged brown stone." SOIL pH: The Lee County Extension Office states that it tolerates a wide pH, including as alkaline as 8.4. Available at many native and commercial plant nurseries in warmer parts of the state. 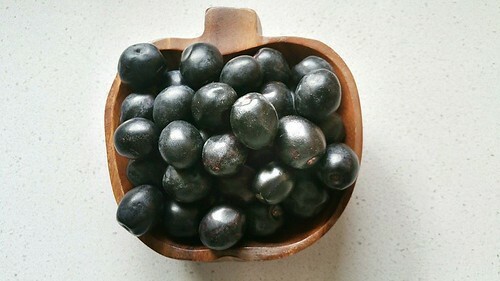 [A] Tim Marshall gave permission to use his photo of ripe cocoplums in a bowl July 29, 2018. Thanks Tim! 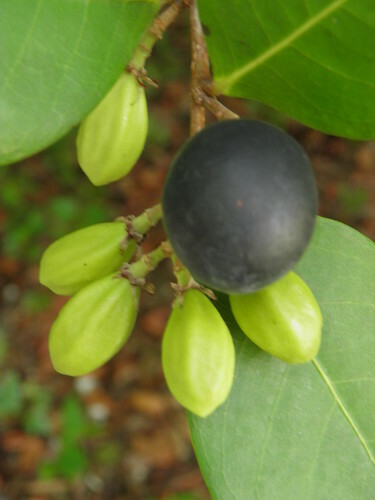 "Chrysobalanus icaco—Coco-plum", Francis, John K., U.S. Department of Agriculture, Forest Service, International Institute of Tropical Forestry, San Juan PR. Presta, Giuseppe Antonio et al. (2007). Effects of Chrysobalanus icaco on the labeling of blood constituents with technetium-99m and on the shape of the red blood cells. Brazilian Archives of Biology and Technology, 50(spe). Bastos Silva, João Paulo et al. (2017). Antifungal activity of hydroalcoholic extract of Chrysobalanus icaco against oral clinical isolates of Candida Species. Pharmacognosy Research, 9. IFAS publication: 50 Common Native Plants Important In Florida’s Ethnobotanical History, Ginger M. Allen, Michael D. Bond, and Martin B. Main.